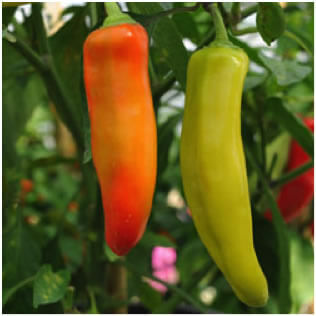 Pepper, Chilli – Hungarian Wax is not the hottest chilli, but an easy one to grow. Very vigorous plant with long pointed yellow fruits. Will turn red when fully ripe. When Christopher Columbus discovered America he believed that he found the black pepper (native of Asia) but in fact it was only the chilli pepper with its fiery taste. Chilli peppers are a wonderful crop for a polytunnel or greenhouse. 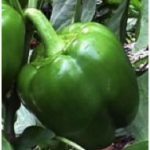 They are a lot easier to grow than peppers and their yield can be phenomenal. In some years I harvested around 100 chillies per plant and we had six plants! Beware though as some varieties are extremely spicy. The Scoville test rates the heat of chillies on a scale of zero to over a million Scoville Heat Units (SHU). The world’s hottest chilli is the Naga Jolokia. Chilli enthusiasts always try to breed an even hotter chilli. Always be careful when handling chillies! Chilli peppers prefer a rich, loamy soil with plenty of well-rotted compost added to it. The pH should be between 6.5 and 7.0. Chillies need to grow in full sun so ensure that there is no shading from other crops. Chilli peppers require a long growing season and should be sown as early as February until mid March at the latest. I usually sow the seeds in a small standard seed tray or pot and space the seeds 2cm apart from each other covered with 1cm compost. The tray should be placed into a warm propagator or warm windowsill. The temperature should be around 18-21ºC. The seedlings start to appear two weeks after sowing. About ten days after they have germinated they should be pricked out into7 cm pots using potting compost. Three or four weeks later they can be potted on into a 10cm pot. Chilli peppers dislike cold temperatures so they can only be planted into the greenhouse or tunnel in early May in mild areas or in mid to late May in cooler districts. Apart from regular watering there is little else you need to do. If the plants grow too upright you can pinch out the growing shoot at about 30cm height. This encourages the plants to become more bushy. Depending on the variety this may not be necessary as some branch out naturally. The plants usually require a single stake to prevent them from falling over. Harvest chillies throughout the summer whenever required. All chillies start off green and then turn into their final colour which nearly encompasses the whole colour spectrum. Green chillies are a little less hot. Towards the end of the growing season in October I usually harvest all the remaining chillies and dry them in the kitchen. The children make them into “necklaces” that can be hung in the kitchen. They will last for well over a year. Chilli peppers are very prone to aphid attacks. Both whitefly and greenfly feed on the leaves of the plants. A regular application of a garlic spray before the problem arises can provide an effective control. If aphids are already present a biological control can be used. Three plants are usually sufficient for a year round supply of chillies.